The 7 call area QSO party is a ton of fun. This year the event was held on Cinco de Mayo from 6 am until midnight–a long Saturday to be sure. This was my second shot at the 7QP. 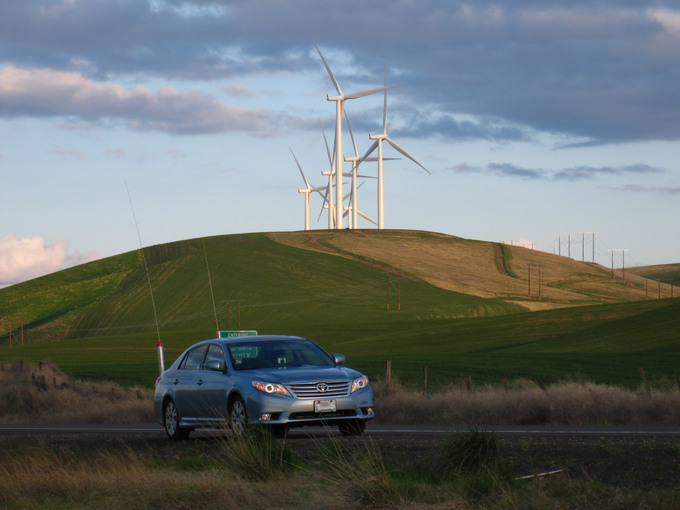 Last year I went solo mobile, working my way east across SE Washington. All was going pretty well until I made my first gas stop in Walla Walla county. It was then I discovered that I had left my wallet at home! A very kind gas station manager agreed to accept my credit card number, phoned in from home. So I had gas to get home, but at that point I turned around and worked my way back west, skipping many counties to the east. I was dispirited for a couple of hours, but then shook it off and made the best of it. In the end I did okay, coming in 4th in the mixed mode, low power, mobile category with 9328 points (22 multipliers, 40 CW QSOs and 152 phone QSOs). Not bad for my first try. This year I went mobile again, but with a twist. My friend David Steven (not a ham, but familiar with the hobby) agreed to chauffeur me around for the day. David has a home near Seattle, but his job keeps him out of state most of the time. He flew in from a lengthy stay in New Jersey just for the contest. In the weeks leading up to the contest, I proposed routes and we discussed them. David was, of course, concerned about driving 18 hours, ending at 3 am in the east coast time zone he was habituated to. 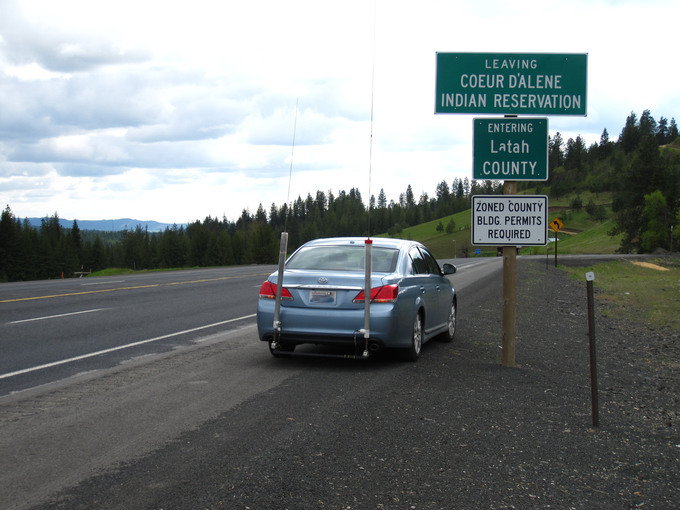 After several iterations, we decided to begin at my house in Redmond, WA, and work our way east on U.S. 2 through Spokane into Idaho, turn south at Coeur d’ Alene and follow US 95 to Lewistown, hitting four Idaho counties in the process. We would then work our way back beginning west starting with U.S. 12. The plan was to stop, if necessary, in Ellensburg and get a hotel. Or I could take over driving back to Seattle. The one thing David required for the trip was a nice car. (That is, he didn’t want to drive around in my crappy 1996 Hyundai Accent that lacks air conditioning and hyperadjustible seats.) 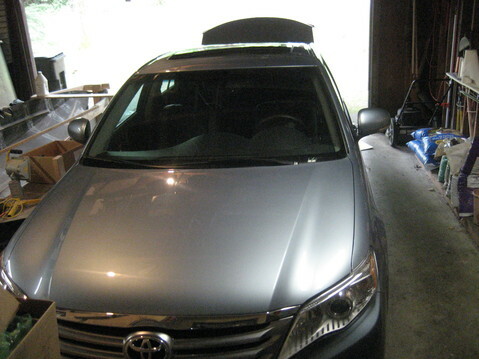 A generous friend made a late model Toyota Avalon available for the adventure. Of course, all modifications to the car had to be completely reversible–no holes, damage or scratches. 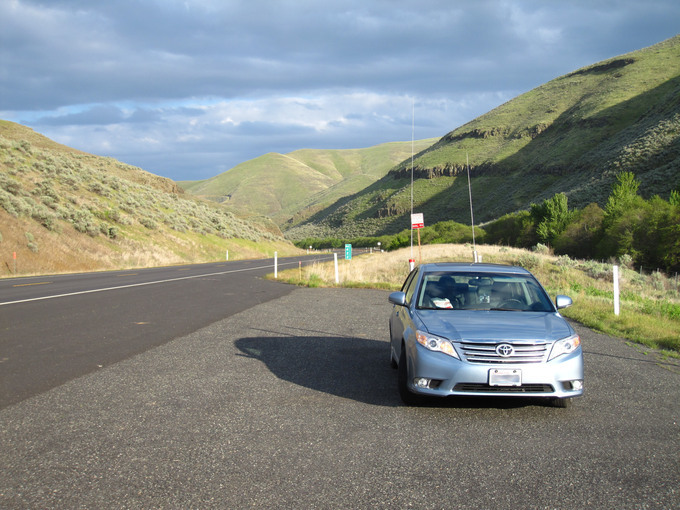 I had the car to myself the day before the contest, and welded up brackets that could bolt up to the vehicle frame and allow me to mount two homebuilt screwdriver antennas off the rear. The dual exhaust system made bracket construction quite complicated. The next trick was finding a route to the battery for power connections. There was a removable rubber plug under the rear driver-side passenger foot well, and an opening in the carpet under the driver’s seat. An electrician’s snake helped route the wire through, and then I wire-tied the cable securely on the underside of the car, being careful to keep the wires away from exhaust system components. Dual fuses were placed at the battery connection, and I even managed to connect the cables to the battery without disconnecting the battery from the car. I installed a second car battery, mounted in a fiberglass battery box, just behind the driver seat, it was connected in parallel to the stock car battery. 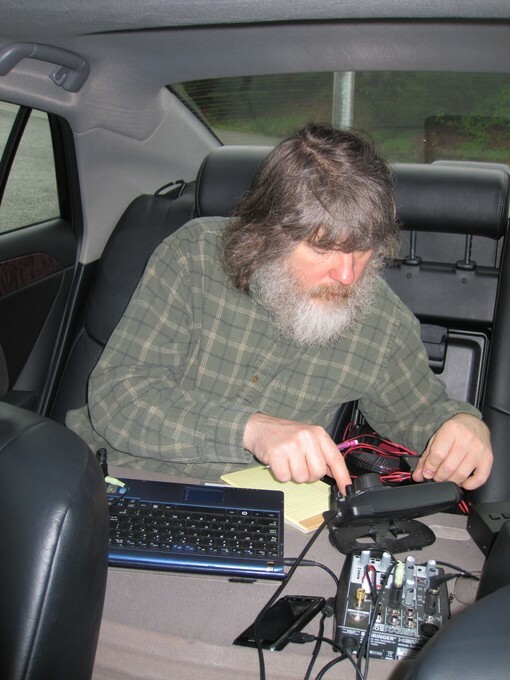 The other trick was routing coax and screwdriver control wires to the two screwdriver antennas. 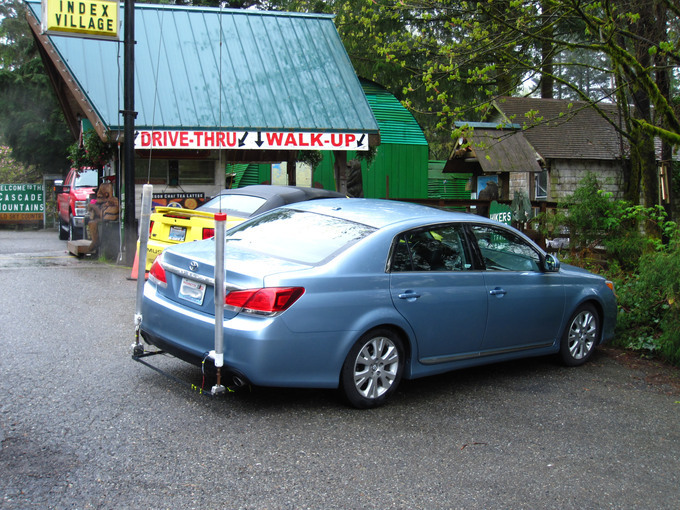 This turned out to be remarkably easy by first going through the “ski door” into the trunk, and then removing a couple of plugs in the well on each side aft of the rear wheel well of the trunk. Again, the only issue was keeping cables away from the hot exhaust system. I had two radios to work with. 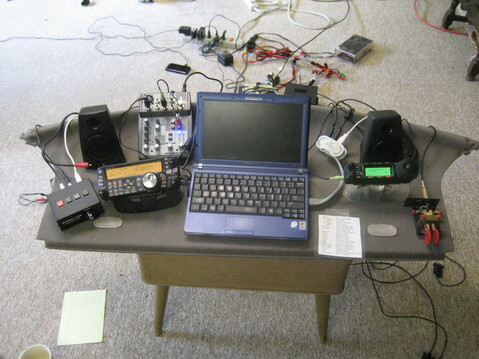 A Kenwood TS 480SAT that served as my primary rig, and a Yaesu FT-857 that served as a second rig. I had purchased a Winkeyer just for the contest. Originally, I was going to work without a computer, and the USB version of the Winkeyer allows one to easily switch between rigs, program CW macros, etc. At some point in the planning, I learned about CQ/X, software that is specifically designed for mobile stations in state QSO parties. Among other cool features, it uses a GPS to keep track of what county you are in. That convinced me to go full gonzo-computer, including logging, sending CW, GPS software, pdf manuals for everything, etc. Everything was just swell as I tested the software on my desktop machine. But on my laptop, I learned that the display is too small for some of the windows! So…on Friday, between waiting for welded bracket pieces to cool, I reverted to N1MM. Admittedly, this was overkill. But the mixer board is particularly nice when using headphones to pan the audio from each transceiver and reduce listening fatigue. Also, the mixer board and computer required AC power. I have DC to AC inverter, but it generates lots of interference on HF (and even 6 meters). So I slapped some snap-on ferrite beads on the leads to the inverter and did a quick test. It seemed to be okay. The rest of Friday was bundling, wrenching, installing, crimping, testing. I hit the sack a little after midnight. David arrived at my house at 5:30 am and we were off by a few minutes after 6:00 am. Things didn’t go well. The inverter was making horrible noise. The screwdrivers were being temperamental. 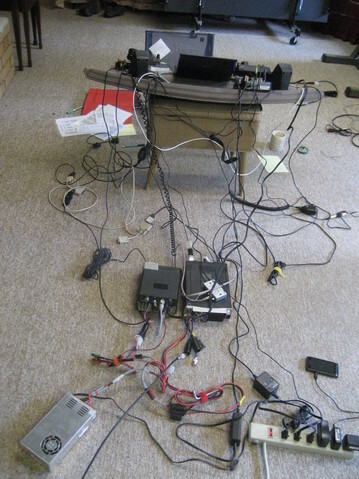 I was even having difficulties with N1MM (which I use all the time at home using this same set-up for contests). We began in King County with about 20 minutes to go to Snohomish County. I had gotten zero QSOs by the time we hit Snohomish—fortunately we would travel through King County again in another 40 minutes. With just minutes to go in Snohomish, I still had nothing. Something had to be done about the noise. After making my first and only QSO in Snohomish County, I decided: The AC powered things had to go. I ripped apart the set-up. Goodbye computer, goodbye amplified speakers, goodbye mixer board. Hello paper logging! 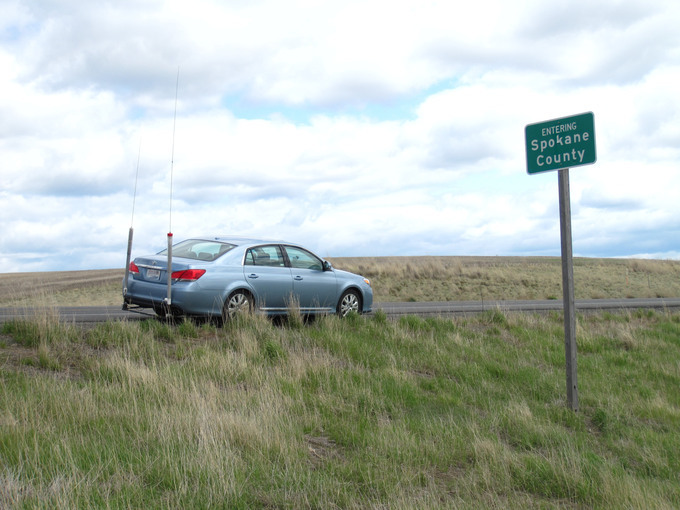 We also briefly dipped back into Washington State in Whitman County before returning to Idaho to finish out Nez Perce County. After we crossed into Franklin, David was starting to fade. He had pulled a very loooong shift. 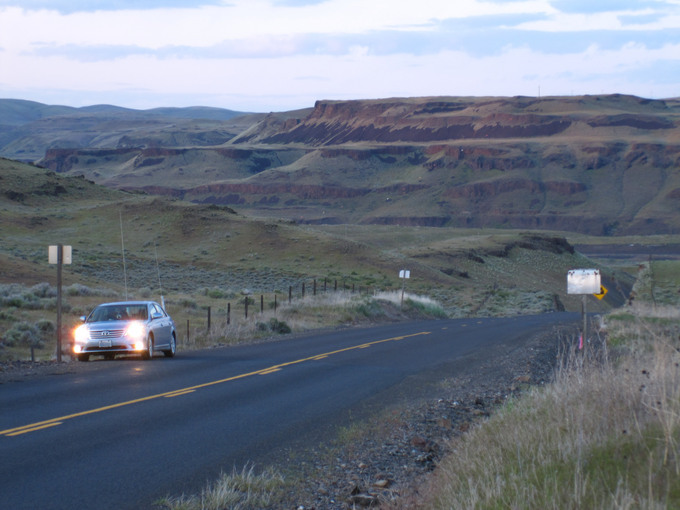 Still, he soldiered on through Adams, Grant, and into Kittitas County. With less than 30 minutes remaining in the contest, we found a motel in Ellensburg, only to be told there was no room in the inn because of some sort of high school sporting event. The person doubted we would find any room in town. No problem. Still pumped up on adrenalin, I volunteered to drive the final couple of hours back to Redmond. 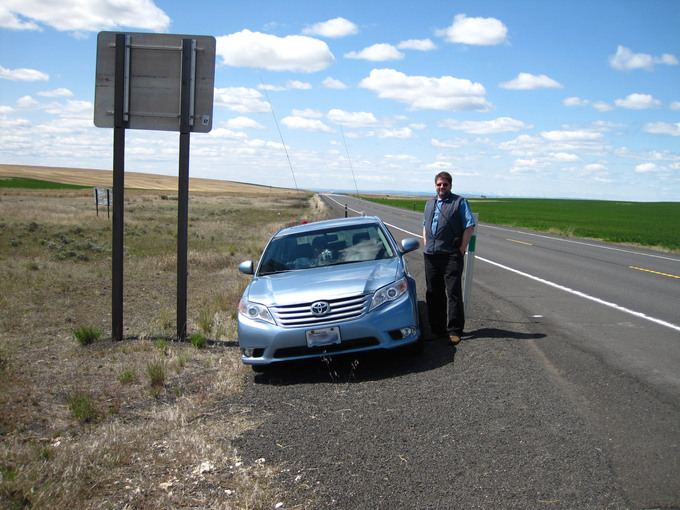 We ended up with an official score of 24,717, including 33 multipliers, 201 CW QSOs and 73 phone QSOs. It was good enough for 4th place in the contest for the low power mixed mode mobile category.